I like the idea of planting once and harvesting multiple times and oca fits the bill. As I make long-term plans for a perennial garden, I’m giving serious thought to growing it. In USDA zones 7 through 10, oca (Oxalis tuberosa) can be considered a perennial. Oca has been cultivated for centuries for its tubers, second in popularity to the potato. Underground tubers are crunchy and beautifully colored. Fleshy stems bear green cloverlike leaves that can be eaten in salads and yellow flowers. Tubers should be planted 2 to 3 inches deep and about 12 inches apart. They will grow in large containers but the tubers will probably be smaller. Oca prefers cool summer nights and winters with late or no frosts for best tuber development. Aging tubers in the open air after digging renders them sweeter. Ocas and papas (potatoes) were said to be the chief roots for food in the Indies and cultivated by the Incas. – J. de Acosta, 1588-90, quoted in the American Journal of Science. Vol. 125. 1883. 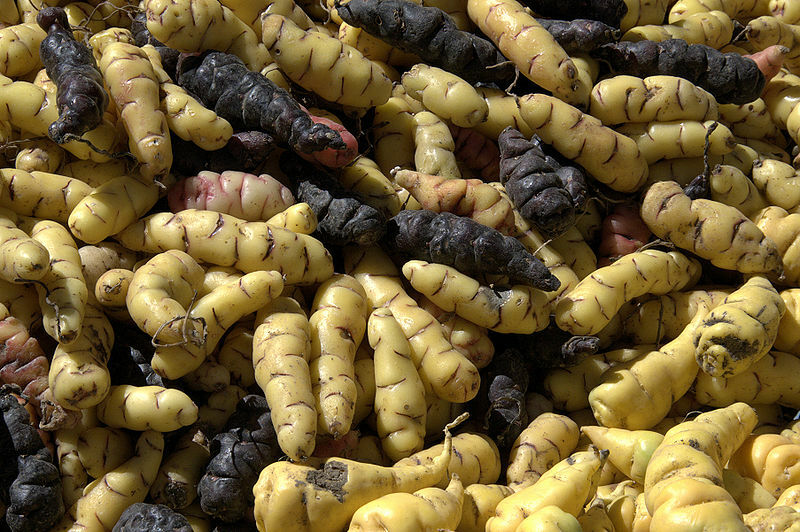 Tubers with a yellow skin (oca blanca) and with a red skin (oca colorada) were the first taken to Europe and Thompson dated their introduction to 1829. While this writer found no other hard evidence to support the exact date of 1829, certainly by the early 1830’s they were known there. – Thompson, Robert. The Gardener’s Assistant. 1878. London. Oca, or oxalic tuberosa, was commonly found in Peru and Bolivia, and early books note it was cooked in Chili as well. Royle noted it had been introduced into England for its “tubers like small potatoes” by the 1830’s. – Royle, John Forbes. Illustrations of the Botany and Other Branches of the Natural History of the Himalayan Mountains. 1839. By this early date the plant was not unnoticed in the U.S. either. The New England Farmer and Horticultural Journal told its readership that the “oxalis tuberosa, found in Chili” had a root similar to a potato. – May 1, 1833. The plant was found in the highlands of Mexico where the “tuberous wood-sorrel” and “eatable-rooted nasturtium” were consumed in place of the yams found in other locales. – The Penny Cyclopaedia of the Society for the Diffusion of Useful Information. “A plant related to our common sheep sorrel, widely cultivated in Peru and Bolivia for the sake of its fleshy rootstocks, which are an important article of food. In some districts ocas are second only to potatoes, while in others ullueus are more important, or at least are sold more generally in the native markets. Ocas are eaten raw as well as cooked, and are also frozen and dried. Ocas prepared in this way are called caya, a term corresponding to…chunyo, the name of the dried potatoes. Raw ocas when first dug have a distinctly acid taste, like sheep sorrel, but this is lost after the tubers have been exposed to the sun. The plant attains a height of 1 foot or more and has the general appearance of a large sheep sorrel. The flowers are yellow and the leaflets are folded at night or in wet weather, the same as sheep sorrel. The varieties are numerous, though much fewer than in the case of the potato. Some are preferred for eating raw and others for the making of caya. The texture of the tubers is very tender, crisp, and juicy. In form, some are nearly cylindrical, while others are slender at the base and strongly thickened at the end. The colors vary from white or light pink through darker pinks or yellows to deep purplish red. The range of colors is much the same as in the ullucu, but no deep-yellow varieties were seen, nor any with spots, except that some have bands of deeper color across the eyes. In addition to the pleasing coloration, the surface of the tubers is smooth and clear, so that the general appearance is very attractive. If the taste should prove acceptable, ocas might become very popular for salads and pickles, if not for other purposes. The nature and habits of the plant indicate that it may be adapted to acid soils, which would be a distinct advantage in some parts of the United States”. – Plant Inventory. 1917. While many today find the flavor appealing on its own merit, in 1860, the Senate and Department of Agriculture, obviously compared it to the potato when they called the oca, “a scanty substitute for more generous means of nutriment”. The oca obviously did not catch on as well as the potato, but for those who want to experiment with perennials, it may be worth a trial to see how well it works for you. – Report. Dept. of Ag. 1860. Now that we’ve considered growing it, how do we eat it? Aside from adding leaves to salads, it can be boiled, baked, fried, put into fresh salads, or pickled. Pigs are said to relish both the tubers and leafy tops so even if it doesn’t become a daily staple, one couldn’t really go wrong in establishing it in the perennial garden. Happy Gardening & Blissful Meals, all! 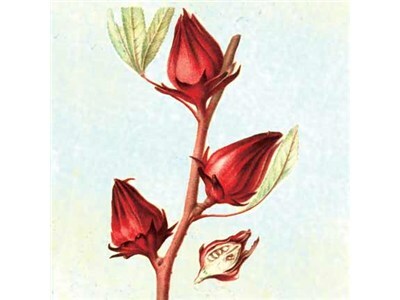 Roselle, or Jamaica Sorrel, was also called the Florida Cranberry, though it is in no sense of the word a cranberry from a horticultural standpoint. It is in reality a Hibiscus (H. Sabdariffa), akin to okra, which is H. Esculentus. In growth it is a strong, tall growing plant from five to seven feet in height and revels in hot weather. For years it has been widely cultivated in the tropics. It does require a long growing period to mature. “The flowers are solitary, with a red and thick calyx. These calices, when cooked, make an excellent sauce or jelly, almost identical in flavor and color with the better known cranberry of the North. It is this fact that has given it the name of the Florida Cranberry. A few plants in the garden will supply all family needs for pies, sauces, jellies and coloring matter, the same as the cranberry, and at a far lesser cost than that of purchasing the Northern grown product. Unlike the okra, however, the green seed pod is not edible”. (-Bateman, Lee. Florida Trucking for Beginners. 1913). Bateman spoke of roselle being grown in south to mid-Florida, however, two years prior Kennerly felt it would do well outside that area. It was noted growing in California. “This is an annual plant that has been sufficiently tested to prove it will grow to perfection in this climate. The fruit resembles Scarlet Podded Okra…It is a native of Australia, and great quantities of it are shipped from this point to all parts of Europe every season and net a handsome profit. Any land that will grow okra will grow the Florida cranberry.” – Kennerly, Clarence Hickman. 1911. Its history is rooted in the Old World Tropics and it was introduced to the West Indies and elsewhere in tropical America. Hans Sloane, reported on it being grown in Jamaica as early as 1707. He found it in most gardens there and said of it, “The capsular leaves are made use of for making Tarts, Gellies, and Wine, to be used in fevers and hot distempers, to allay heat and quench thirst”. – Yearbook of Agriculture. A late Victorian writer said the flowers on the plant open at sunrise and close about noon. The flowers are beautiful and look like hibiscus flowers. In addition to pies, sauce, and jelly he claimed the fruit made good wine and “temperance drinks”. – The Florida Agriculturist. Vol. 25. 1898. Making it even more versatile in the kitchen, a writer informed us in 1909 that a salad could be made of stems, leaves and calices “just as turnip salad… A syrup that can be used for coloring purposes can be made of calices or stems and leaves. This may be boiled in the ordinary way and sealed in bottles for future use.” – Transactions of the Florida State Horticultural Society. 1909. In that vein, The Country Gentleman told its readers that the bottled juice makes a superb drink and can be used in punches. – April 29, 1916. Some In addition to its uses in the kitchen, in some parts of the world the plant is used for fiber. China and Thailand are the largest producers today. Thai Red roselle can be purchased from the Southern Exposure Seed Exchange and Baker Creek Heirloom Seeds. It is said to be the earliest variety to begin flowering in trials in Virginia for the Seed Exchange. Pick the pods that grow at the junction of each leaf, boil them and strain through a cloth or sieve, add a pint of sugar to each pint of juice, and boil again until it thickens and set aside to cool, when it will form a perfect jelly.” – Kennerly. 1911. Pick and wash the roselle berries, trim off the tip ends that seem withered. Cut off stems close up around the calyx. Then split open one side, thus letting the center part drop out. The outside part of the berry is the only edible portion. Now wash them again and put two cupfuls in a saucepan, add one-half cupful of cold water and a scant half-cupful of sugar. Cook, stirring constantly, about five minutes, or until soft. Then turn out in earthen bowl and eat cold with turkey or chicken. They are less sour and bitter than the cranberry and have a delicious flavor. – The Florida Tropical Cookbook. 1912. Trim and wash the roselles. Take the centers out. Fill crust, add one-quarter cupful of sugar, two or three tablespoonfuls of water, a sifting of flour and some tiny pieces of lemon. Put on upper crust and bake fifteen minutes in hot oven. – The Florida Tropical Cookbook.